With the financial backing of a powerful research corporation, Dr. Paul Gironda (Robert Frazer) discovers a scientific process for making synthetic gold–but mysteriously vanishes shortly thereafter, along with his gold-making formula. Master sleuth Craig Kennedy (Jack Mulhall) investigates Gironda’s disappearance at the behest of Federal agent Gordon Gaunt (William Farnum), who’s concerned about the impact Gironda’s discovery could have on the national economy; Kennedy soon discovers that a mysterious master criminal called The Clutching Hand is behind Gironda’s disappearance–and that, though the Hand has kidnapped Gironda, he is still looking for the doctor’s formula. In his race to rescue Gironda and find the formula before the Hand does, Kennedy is helped by Gaunt and reporter Walter Jamison (Rex Lease), while he’s hampered not only by the Clutching Hand and his henchmen but by a dizzying assortment of other suspicious, shady, or downright criminal characters. The Clutching Hand, like most of the other serials turned out by independent producers Louis and Adrian Weiss, features a narrative that’s at once too thin and too convoluted. Writers George Merrick, Eddie Granemann, Leon D’Usseau, and Dallas Fitzgerald take a rudimentary storyline and complicate it without improving it–mainly by overloading it with supporting characters that are hazily defined and have scant connection to the main plot. The ex-convict Mitchell, the phony mystic Hamik, and Dr. Gironda’s wife are particularly superfluous; though a fair share of the serial’s footage is devoted to Mitchell’s efforts to blackmail Mrs. Gironda and to Hamik’s attempts to steal her jewels, both of these fairly mundane subplots have almost no bearing on Craig Kennedy’s battle with the Clutching Hand–and are also handled so repetitively that they lose whatever interest they may have possessed; chapter after chapter features near-identical scenes of Mitchell visiting the Gironda home and making mysterious threats, or of Hamik and his assistant attempting to instruct Mrs. Gironda in the “Seven Steps to Perfection” as a prelude to robbing her. Only when Hamik and Mitchell are eliminated from the serial (in Chapters Eleven and Twelve, respectively) do these repetitious and pointless sequences cease. Above: Hamik (Gordon Griffith, right) and his assistant (Roger Williams) prepare to conduct a “ritual” with the aid of Mrs. Gironda (Mae Busch). The serial’s main storyline is pretty repetitious itself. 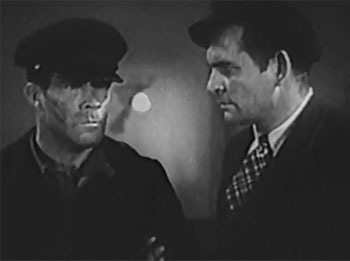 The duel between Kennedy and the Hand essentially resolves itself into a series of fruitless searches of the same rundown waterfront area by the detective and a series of equally fruitless murder attempts by the villain–varied occasionally by the Hand’s stubborn efforts to force Gironda’s secretary Shirley McMillan to give him the missing formula (which she doesn’t have), and by Kennedy’s periodic interference with the scheming of the aforementioned Mitchell and Hamik. There’s almost no investigation of possible Clutching Hand suspects–an unfortunate omission, since this plotting avenue could have provided more interesting relief from the endless hunt for Gironda and his papers than the Hamik and Mitchell subplots do. Unlike Mascot’s mystery-villain serials, Hand contains no protracted sequences designed to direct suspicion towards different supporting characters, and no concerted campaigns by the hero to unmask the villain; all of the serial’s characters come off as singularly uninterested in the riddle of the Clutching Hand’s identity. 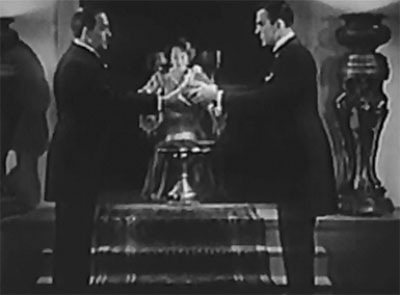 The “mystery” of the Hand does resemble a Mascot plot in one particular, however; the villain’s unmasking blithely contradicts several earlier scenes. 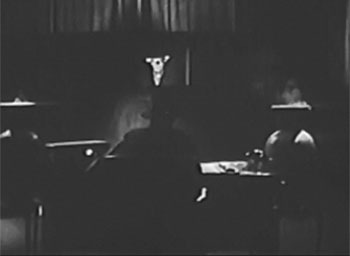 Director Al Herman and cameraman James Diamond manage to sporadically enliven Hand with impressive visual touches at times, giving a shadowy and atmospheric look to sequences like Kennedy’s various explorations of secret passages and the Clutching Hand’s repeated conferences with his henchmen; the scene in which Jameson smashes through a glass door to rescue Kennedy and Shirley McMillan (swinging an urn directly at the camera) is also striking. Unfortunately, scenes of this kind are outnumbered by flat and pace-slowing “suspense” sequences that are generally either too unfocused or too dragged-out to seem very suspenseful, examples including the gas-bomb attack on Kennedy and Jameson in Chapter Two (which is treated with confusing casualness by both writers and director) and the interminable Chapter Five sequence in which first Shirley and then Kennedy hesitate before entering a sinister building. The serial’s pace is additionally slowed by a continual procession of dialogue scenes designed to give a modicum of screen time to each of the serial’s numerous characters–scenes that are filmed so statically that they look more like they belong to 1930 than to 1936. 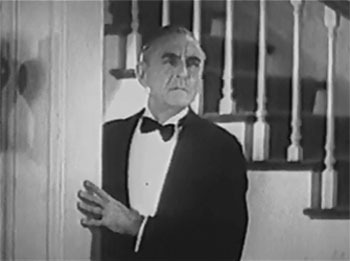 Above left: Jack Mulhall searches a secret passage in a well-shot scene. 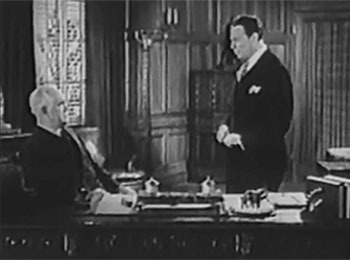 Above right: Joseph Girard (seated) confers with Mahlon Hamilton in a much more flat-looking scene. The confusion and boredom generated by Hand’s cluttered storyline and slow pacing is frequently (but never permanently) dispelled by a generous helping of action scenes. The chapterplay’s fistfights (executed by stuntmen Yakima Canutt, Eddie Parker, and Carl Matthews, and by many of the serial’s actors as well) are often clumsy-looking but are also pleasingly energetic, combining as they do the awkward flailing punches common to many 1930s serials with far more dynamic flips and leaps. The lengthy Chapter Two chase and fight aboard the boat the Nellie D., the Chapter Five fight in the back room of the Harbor Hotel, the Chapter Six fight in the Hotel’s barroom, the Chapter Eight fight in the same location, and the large-scaled and nicely-shot fistic battle on the decks and in the rigging of the Nellie D. in Chapters Thirteen and Fourteen are particularly entertaining. The car/motorcycle chase scene in Chapter Three (which features a good cycle-to-car transfer) is also noteworthy, as is the car chase through the hilly Los Angeles streets in Chapter Six. Above left: A lively brawl on the interior balcony of the Harbor Hotel. 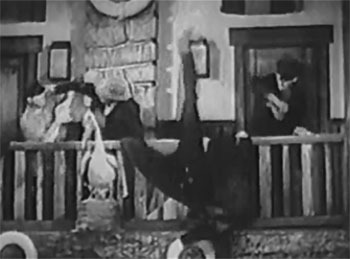 Above right: An impressive rope-slide from the Chapter Thirteen battle aboard the Nellie D.
The action’s tendency to center around either the Nellie D. or the Harbor Hotel barroom was obviously a result of the Weisses’ desire to get their money’s worth out of the rental fees and extra’s salaries involved in creating the two locations; the Nellie D. is represented by a genuine full-size boat (the same one used as Shark Malone’s ship in the Weisses’ Black Coin), while the hotel barroom is a spacious interior set populated by many rowdy sailors. Dr. Gironda’s laboratory, which is packed with the famed Kenneth Strickfadden’s impressive electrical props, undoubtedly consumed a portion of the serial’s budget as well–but is given less screen time than the boat or the hotel, only really figuring prominently in the first and last chapters; the Hand’s interesting television communication device–a forerunner of today’s real-life teleconferencing systems–appears throughout the serial, however, as does Kennedy’s similar telephone/television device. The exteriors and grounds of the Gironda mansion aren’t bad either, although the interior of the mansion’s supposed “colonnade” looks nothing like the inside of an actual colonnade. 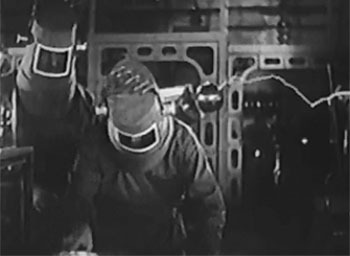 Above left: Gironda (Robert Frazer) and his assistant (Franklyn Farnum) work in the doctor’s lab as Strickfadden equipment arcs in the background. Above right: The Clutching Hand (seated, back to camera) teleconferences with a henchman (Bob Kortman). The cliffhangers in Hand are mediocre for the most part; far too many of the serial’s chapters end either with shots being fired in the dark or with hands suddenly reaching out to throttle various protagonists. 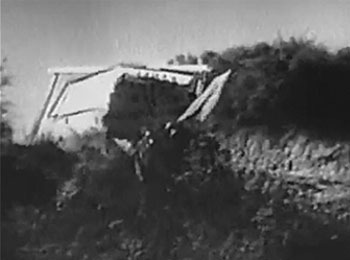 However, these endings at least feature action of a sort–unlike the Chapter Seven cliffhanger, in which the heroes open a package to find a bomb that doesn’t explode; the mere sight of the deadly contrivance is apparently supposed to be enough of a jolt to end the episode on, but the close-up bestowed on it is so brief that its menace fails to register at all. Similar abruptness mars the Chapter Six cliffhanger in which Kennedy and Shirley McMillan are threatened by poisonous gas, although this ending overall is one of the serial’s better ones (due to good camerawork); the Chapter One cliffhanger, with the hero getting zapped by some of the sparking Strickfadden equipment, is another of Hand’s better cliffhangers, while the car-crash ending of Chapter Twelve is distinguished by the additional flourish it gives to a stock cliffhanger scene: Kennedy’s car plunges neatly through a roadside sign before making its expected departure from the highway. The Chapter Four barn explosion is interesting, but spoiled by a cheat resolution; cheating is also used to save Kennedy from the more mundane mugging that he’s threatened with at the end of Chapter Five. 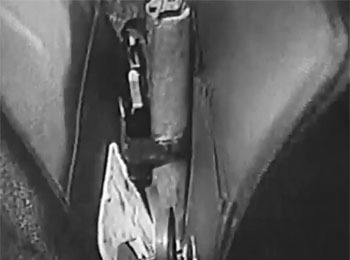 Above left: The brief bomb close-up that concludes Chapter Seven. Above right: Kennedy’s car plunges through a sign as it leaves the road at the end of Chapter Twelve. The Clutching Hand’s cast is packed with once-famous stage and silent-film veterans, but many of them are kept so busy trying to deliver confusing and excessive dialogue in a minimal amount of takes that they fail to give particularly interesting or distinctive performances. Jack Mulhall’s infectious and irrepressible energy does shine through in the scenes in which his Craig Kennedy is genially greeting or consoling friends and allies, or when he’s briskly organizing his campaign against the Clutching Hand; his cheerful hamminess when Kennedy is disguised as various roughneck sailors and as a genteel French knife collector is also very entertaining. 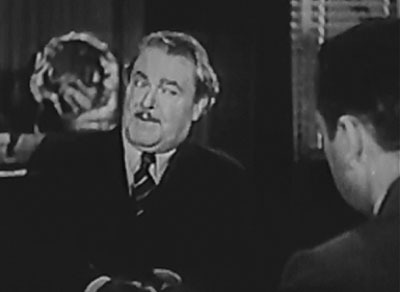 However, Mulhall becomes painfully stiff whenever he’s called on to play the stereotypical Great Detective; when delivering wordy explanations of his deductive thought processes, making wordy verbal tests of suspects’ alibis, or giving wordy accounts of the progress of his investigation, he uses a delivery so slow and deliberate that one gets the definite impression that he’s sparring for time while trying to remember his lines. As Jameson, Kennedy’s “Watson,” Rex Lease has less dialogue to tackle than Mulhall does, and thus never comes off as particularly lost or uncomfortable; his performance is assured and breezily good-natured, if somewhat bland. 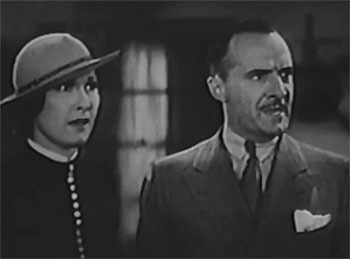 As Verna, Jameson’s fiancée and Dr. Gironda’s adopted daughter, Marion Shilling is not only attractive but also manages to successfully convey genuine emotional concern over her father’s disappearance, and delivers one of the serial’s less stilted and more appealing performances; however, she’s unfortunately given very little to do. 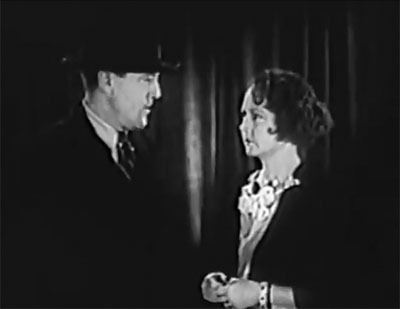 As secretary Shirley McMillan, Ruth Mix has much more screen time than Shilling does, but turns in a much weaker performance; she’s fine when she’s called on to act calmly capable, but her attempts to convey terror when confronted by the Clutching Hand fall pretty flat, while her delivery of expository dialogue is often dreadfully wooden (she’s quite obviously reading her lines off a piece of notepaper during one scene in Chapter One). Above left: Rex Lease and Marion Shilling share a lighter moment. Above right: Ruth Mix is upset by an accusation leveled against Gaston Glass, while Glass himself looks annoyed. Mae Busch, a prominent silent-era actress, is unable to make much of the poorly-defined Mrs. Gironda character–who’s depicted as shifty, worried, and gullible by turns, and whose motives are kept in the dark for much of the serial and never fully explained; Busch plays the character as coolly determined and almost hard-boiled much of the time, but indulges in highly theatrical hysterics in her last extended scene. As her ex-convict persecutor Mitchell, Robert Walker portrays a rugged and mercenary character pretty similar to his Shark Malone in The Black Coin, but plays a less prominent part in the plot; as in that serial, he does an acceptable job of acting quietly tough and cynical, but lacks the formidable appearance and the larger-than-life swagger that could have made his performance truly memorable. 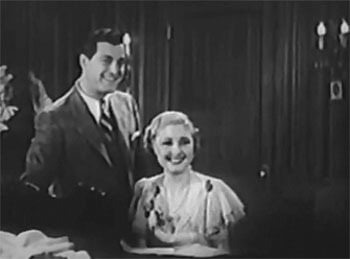 Above: Robert Walker and Mae Busch. 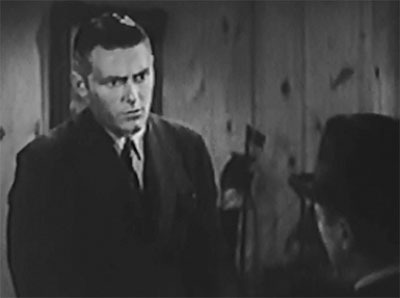 As federal investigator Gordon Gaunt, William Farnum seems less bothered by the undoubtedly rushed filming schedule than some of the other actors; a veteran of the stage, he uses dramatic gestures and facial expressions to smooth over apparent failures to recall lines, and comes off as consistently authoritative and dignified, though undeniably hammy. Bryant Washburn also does a solid job as the ruthless research-company executive Denton, alternating between sinister suavity and brusquely irritable impatience. 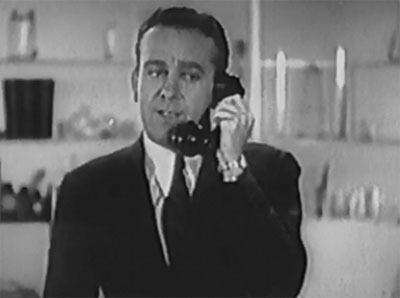 Mahlon Hamilton is much more unrelievedly blustery and cranky as Montgomery, the research-company president, while French-born silent star Gaston Glass–who plays the suspicious research scientist Dr. Bouchard–delivers his lines in an excessively slow and hesitant style that becomes quite bothersome after awhile. Above: William Farnum raises his eyebrows, rolls his eyes, and generally hams it up as he confers with Bryant Washburn (back to camera). Future A-film star Jon Hall (billed here as Charles Locher) is very oddly cast as Hobart, the shady Harbor Hotel proprietor who first serves as Mitchell’s accomplice and later throws in with Denton; he displays proper gruffness and surliness, and turns in a credible (if forgettable) performance, but the role would have been a much better fit for a seasoned character actor like Edmund Cobb or Bud Osborne (someone in production must have realized that Hall was a bit too young and handsome for the part, since his hair is given artificial touches of gray). Gordon Griffith is slick as the dissembling Hamik, but hasn’t the showily commanding presence one expects from a spiritualist poseur; Roger Williams is typically surly and glowering as his accomplice. Above: Jon Hall plots with Robert Williams (back to camera). Reed Howes is subdued but likably tough and dogged as Kennedy’s trusty assistant Sullivan, while Franklyn Farnum (no relation to William) does a good job of acting craftily thoughtful as Gironda’s assistant Nicky. As Gironda, Robert Frazer is his typically suave and sonorously dignified self in the first chapter, and also gets to indulge in more atypical histrionics in the final chapter–but has basically nothing to do in the intervening chapters. Frank Leigh, as the Gironda butler, leers and lurks in almost parodic fashion, and Joseph Girard is as ponderously solemn as ever in the role of the research corporation’s upright lawyer. Above left: Reed Howes (left) confronts Yakima Canutt and other off-camera heavies. Above right: Frank Leigh creeps around suspiciously. Roy Cardona makes little impression as one of the Hand’s chief henchmen, but Yakima Canutt and Bob Kortman are characteristically tough and threatening as two of the Hand’s other recurring thugs; Carl Matthews, Eddie Parker, and Earl Douglas play other henchmen, while Douglas also takes a second role as Gaston Glass’s manservant (whose character name seems to change between scenes). 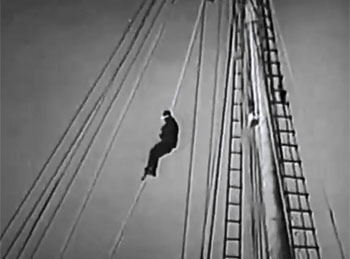 Knute Erickson and Richard Alexander do amusing turns as a crusty ship’s captain and his loyal but overzealous first mate; the scene in which Alexander prevents Erickson’s crew from jumping ship, but beats them all unconscious in the process–and then sheepishly submits to a rebuke from the irritated captain–is genuinely funny. 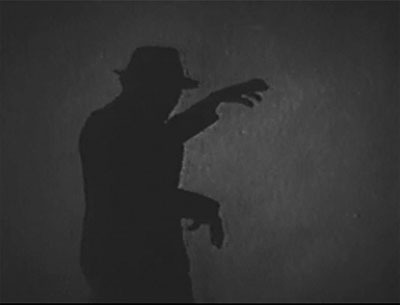 The Clutching Hand invariably appears as a shadowy figure in an ordinary hat and overcoat; his coolly and grimly confident voice is effectively sinister, but the maniacal laugh he periodically emits is so forced as to sound funny. His appearances are accompanied by an ominous and eerie music cue that’s used to underscore a few other “suspense” scenes, but which wears out its welcome through incessant repetition–since it’s the only piece of music used in the serial. 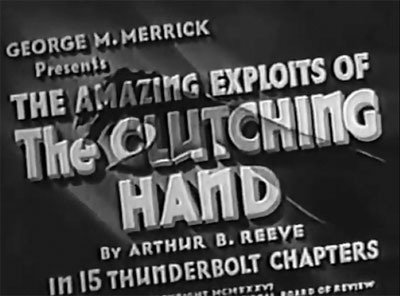 The Clutching Hand had the potential to be an entertainingly atmospheric and colorful mystery serial–but is instead scuttled by its over-involved but uninteresting plotting and its highly uneven production values. Despite a good cast and a respectable collection of action scenes, it’s likely to prove a pretty wearying and frustrating viewing experience for even the most devoted serial buff. A Note on the Source: The character of scientific detective Craig Kennedy, basically an updated and etiolated version of Sherlock Holmes, was created by writer Arthur B. Reeve; Kennedy figured in many short stories and novels during the 1910s and 1920s, and also appeared in multiple silent movie serials–in one of which, the extremely popular The Exploits of Elaine, he was pitted against a villain known as the Clutching Hand. 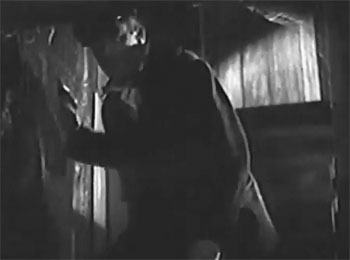 Hence, the several references to the Clutching Hand as Kennedy’s “old archenemy” in this sound-era revival of the Kennedy character–references that, like several other scenes in the serial, make little sense when the Hand’s true identity is revealed in the final chapter. This entry was tagged Bob Kortman, Bryant Washburn, Jack Mulhall, Richard Alexander, Stage and Screen serials, Tom London. Bookmark the permalink. There are serials I love, others I like, and those I tolerate. I can honestly say that I can find something to like in most any serial. I have to admit that [THE CLUTCHING HAND] almost caused me to break my word. Jack Mulhall was the saving grace here. Too static, too many subplots and clues that led no where and the list goes on. Only one other serial [CUSTERS LAST STAND] out ranks TCH with these drawbacks. Rating……..2 stars out of five. I haven’t watched them all yet, but of the ones I have, this is the worst– * out of *****–it was just a boring story with a tedious and off-putting musical score. It was a chore for me to get through this one. I saw the first 12 chapters almost 50 years ago, and just can’t force myself to see the rest. Easily one of the bottom ten serials.